How to start a money-making blog? The Headline also is known as a post title in WordPress is the first thing your readers will see on social media, search engine results, email newsletter or on your blog. In this article, we have listed 170+ catchy headlines examples and 18 headline tools to create and optimize engaging headlines. We have published an in-depth 6500+ word ultimate guide to starting a blog from scratch without any technical knowledge. Don’t forget to read and share it with others. After reading this article, You will be able to write Catchy Headlines to grab your readers attention. 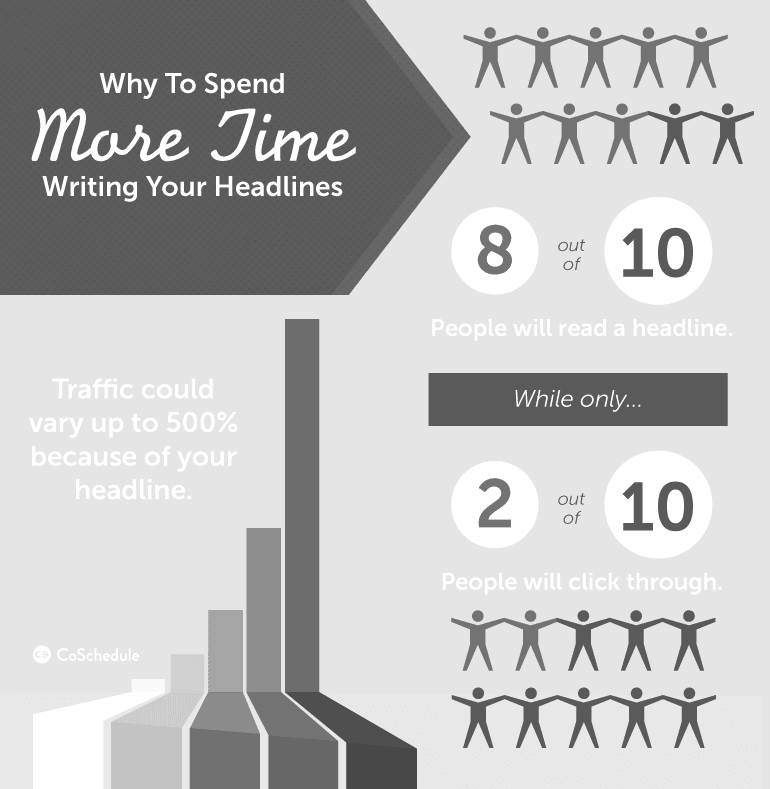 A powerful and catchy headline can drive a lot of traffic to your blog. On average, 8 out of 10 people will read headline copy, but only 2 out of 10 will read the rest. This is the secret to the power of your title, and why it so highly determines the effectiveness of the entire piece. The most important part of an article/blog post is the headline (post title). As a blogger, You should not ignore your post title. Here are 170+ examples of catchy headlines. Always try to Write your blog title before you write your blog post. This practice will help you define the value proposition so you can connect it into the blog post, which guarantees your blog title will deliver on its promise. Here is an info-graphic from VerveUK, which shows you 71 terrific templates for the blog post titles. 71 Templates For Blog Post Titles Ideas Infographic. Use Numbers and Facts To Get 206% More Traffic To Your Blog Posts. Informal research from Canva and Ian Cleary of Razor Social suggests that including numbers in your blog titles can double your social shares. Data from Brian Dean at Backlinko also suggests that including numbers in your blog titles can increase your click through rate by 36%!. ——- VS ——-: Which do you need? ——- VS ——-: Which is really Better? The number 1 thing that will help you write successful blog titles is by first creating content your audience will be deeply interested in learning more about. Use the words that describe the topic in your blog title. For example, this blog post is about Headlines and we have used Catchy Headlines Examples to grab readers attention. After completing analysis of the top 10 search results for more than 20,000 keywords SERPIQ revealed that length of content on the page had a direct correlation to the placement of the search results. Studies have found that long-form content works really best and Google loves lengthy content. We are talking about 2000+ words. Amazing Headline Secrets to Get 438% More Traffic. A very basic principle in content marketing is to look back at your best content and repeat its success. CoSchedule had taken this idea to the next level to help them use their data from past content to help them plan better content and actually predict future growth. That analysis revealed that top-performing content reflects four key traits extremely well. On the other hand, worst-performing content does poorly in all four areas. To learn more about headlines secrets, read 101 Catchy Blog Title Formulas That Will Boost Traffic By 438% at CoSchedule Blog. This is an in-depth guide written by Nathan Ellering at CoSchedule blog. In this post you will learn how to write eye-catching headlines to grab readers attention, Blog Title Tools To Take Your Headlines To The Next Level, 100+ headline templates from CopyHackers, CopyBlgger, CrazyEgg and CoSchdule. Since CoSchedule is a social media editorial calendar tool, they have access to millions of blog titles. Literally. So, being the data nerds, they looked at more than 1 million headlines and found the words used most often in the top shared content. 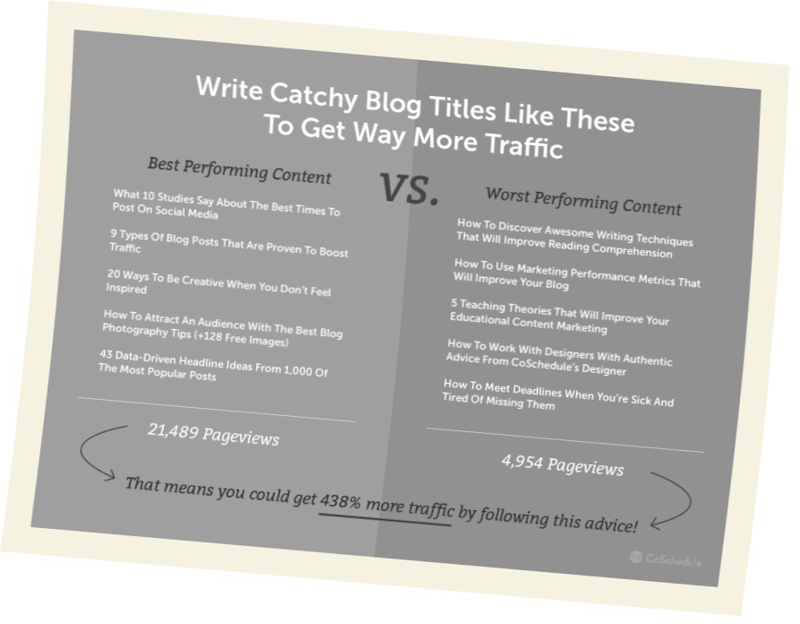 From there, CoSchedule also compiled a list for you of those 500 words to use as a tear sheet for inspiration the next time you’re writing blog titles. Headline Templates used by CopyHackers, CopyBlgger, CrazyEgg and CoSchedule. How Your [Service Provider] ls Ripping You Off. And What To Do About It Right Now. See Why We Have An [Adverb] [Adjective] [Social Problem] In Just [Short Time]. Is This The World’s First [Good, Bad, Or Desirable Thing]? [Person Does X.] [Another Person’s Reaction.] Result: Priceless. Why Haven’t [People Like Your Readers] Been Told These Facts? ls It Immoral To [Get Desirable Outcome]? Do You Have The Courage To [Do Something Very Desirable)? This [Bad Thing] Just Happened. [Outcome Or Media] ls [Adjective]. How To [Get Incredible Result] And [Do Unexpected Thing As A Result]. Stopped [Doing Common Thing] Today. You Should, Too. Here’s Why. I Spent [Time] [Working Toward Goal]. I Just [Quitting Statement]. Here’s Why. I Don’t Regret __________. But here’s What I’d Do Differently. Would You [Do Unimaginable Thing]? I Just Did. Why Don’t [Role] Get [Desired Outcome]? Do You Wish More People Bought Your [Product]? 9 Out Of 10 [Group Members] Can’t/Don’t __i_. Are You One Of Them? How To Permanently Stop Your ii, Even If You’ve Tried Everything! [Verb] These [#] [Noun] For [Adjective] [Noun]! We have covered all the secrets and headline tools to write catchy headlines for your blog posts, Now it’s time for you to use these awesome headlines on your blog and get more page views.